Happy Luke Casino also known as HLPokies brings the best slots, table games and video pokers to online gamblers. 11 software developers lend their talent and expertise to provide the casino with the finest assortment of games. Happy Luke Casino also goes by the name of HLPokies, which is very popular in the southern hemisphere. Slots are commonly referred to as pokies by Australian players and this online gambling operator has plenty of such games. Most of its members are located in southern Asia, but they also cater for international gamblers. Those who reside in Hong Kong, Singapore, the Philippines and the US are not allowed to gamble here. Happy Luke Casino strongly believes in the importance of keeping its security protocols up-to-date to tackle the latest challenges. A combination of SSL encryption provided by COMODO and firewalls serve the purpose of keeping wrongdoers at bay. The security experts have done a brilliant job so far and prevented cyber criminals from stealing information or funds. Conversely, the games provided by seven leading software developers are audited twice: once in house and then again by independent companies. This double layer of vigilance is supposed to create a safe gambling environment for those who play here on real cash. 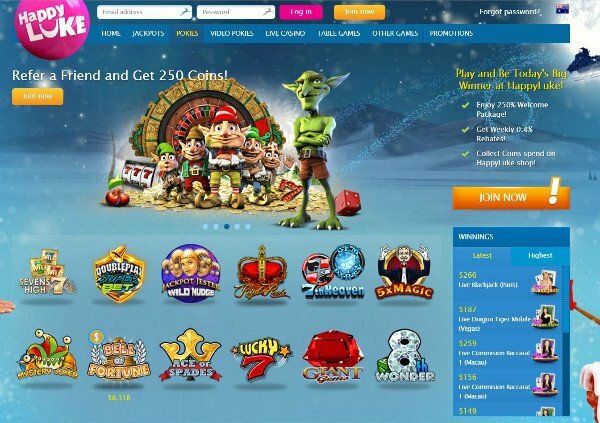 Happy Luke online casino offers games provided by Microgaming, NetEnt, Play’n GO, Betsoft, Thunderkick, Quickspin, Plain Gaming, Yggdrasil and NextGen. Ezugi is the software developer running the live casino section so all bases are covered. Just as the name suggests, pokies or slot machines are the most popular and numerous of the games offered. As a result of working with several software developers, the casino is able to offer original and innovative titles. Starburst, A Christmas Carol, Birds on a Wire, Illuminous and Rook’s Revenge are just a few of the games that can be played here. Microgaming and NetEnt are responsible for providing the best paying games, which come in the form of progressive jackpot titles. Betsoft is another slot machine expert, famous for its 3-D graphics and charming animations. In the other games category, players can find scratch cards, Virtual RaceBook 3D and Skratcherz as well as lottery inspired titles. HappyLuke Casino games also include different types of blackjack, roulette and baccarat. Among the table games that can be played only against the random number generator, Caribbean Stud Poker, Triple Edge Poker, Casino War, Craps and Red Dog are the most popular. There are fewer options for video poker fans, but this collection is growing at a rapid pace. Happy Luke Casino games can also be played on the move by those who own smartphones and tablets. Regardless of the operating system powering them, these devices should be able to run most of the games smoothly. There is no need to download an app and the instant play format grants immediate and unrestricted access to all pokies. As for live dealer games, there are five distinct virtual casinos manned by professional dealers. Ezugi overseas Casino Macau, Casino Tokyo, Casino Seoul, Casino Reno and Casino Manila, each with a distinctive theme and unique format. HappyLuke Casino payment methods are highly reliable, despite being restricted to three financial instruments. Eco, Skrill and Neteller are the options available, with credit cards and wire transfers missing for the time being. In addition to the standard pending time period of 72 hours, players only have to wait an additional 24 hours for electronic wallets. There is a withdrawal limit of $5.000 per day, which is high enough to make it easy to cash out even progressive jackpots. Happy Luke Casino support is available between 9 AM and 4 AM Australian Western time. Outside business hours, players can use email or the online form, but otherwise live chat is the most popular. Someone will get back to you in just a couple of minutes and you will talk to a specialist who is fluent in English. A 24/7 customer support would be nice but 5 off hours are definitely not a dealbreaker. Happy Luke Casino promotions are so numerous that they can feel a bit overwhelming. It all starts with the introductory offer which has the first three deposits matched for a combined AU$1500. The first investment is matched by 100%, the second and third by 50% and players are supposed to deposit at least $10 to qualify. Bonus funds are automatically updated and subject to a 40 times wagering requirements, before cash outs are allowed. The Daily 10% Reload Bonus is actually an ongoing campaign that will have all future investments matched by 10%. Just as the name suggests, the casino will match the deposit on a daily basis and the limit is set to AU$40. To maximize the return on investment one would have to deposit $400 per day and once again the minimum accepted amount consists of AU$10. This promotion can’t be used in conjunction with other offers so players are supposed to clear existing bonuses before applying. Another popular promotion will match all profits by 0.4% as a part of the weekly rebates. In order to qualify for this offer, one would have to produce a net revenue of at least $5000 over the last seven days. This is not an automatic campaign, so players need to get in touch with customer support and register before the rebates are applied. The maximum amount can’t exceed $5000 and eligible players will receive their bonuses on Wednesday and 8 PM. 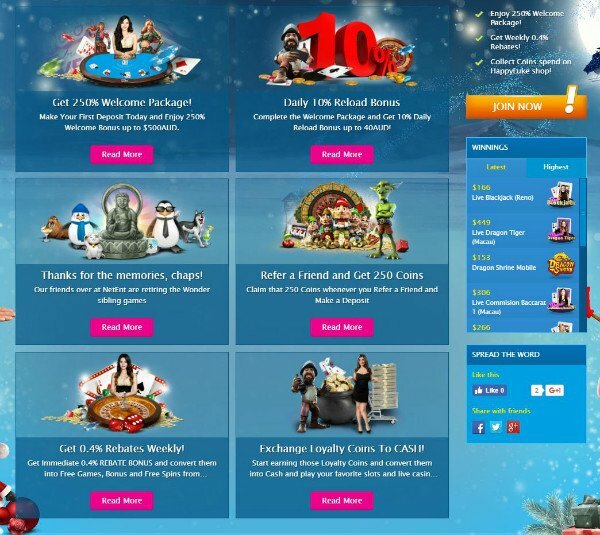 Happy Luke Casino referral program has been revamped to further expand the customer base. All those who have a real money account and refer a friend are going to be eligible for 250 coins. The friend recommended needs to sign up for a real money account and make a deposit for both of them to be rewarded. HappyLuke Casino chose to offer coins instead of cash but they can be redeemed in the loyalty shop for money or branded merchandise. Those who have friends willing to join an online casino only need to enter their name and email address. They can send as many invitations and once their buddies sign up, both are eligible for payouts. Loyalty coins can also be earned by playing any of the games available, as a part of the VIP program. Players can collect a maximum of 6500 loyalty coins every week and convert them for AU$50 by contacting support. Some Happy Luke Casino have limited time availability and are aimed at certain holidays. The casino celebrates Halloween by sending a lucky player on an all paid weekend getaway if he or she wins the upcoming raffle. Four slot machines qualify for this campaign and they go by the name of Witches’ Cauldron, Grave Grabbers, Graveyard Shift and Beowulf. The best part is that players can use both cash and bonus funds to accumulate the necessary points. The winner will travel to Macau and have all expenses paid, including accommodation and return flights. The casino will even provide pocket cash for those who want to experience the thrills of land-based gambling in the Las Vegas of the East. The weekend getaway winners will travel to Macau from November 18 to November 20 and spend the time of their lives. happyluke.com is one of the new online gambling operators, with high expectations and the resources to fulfill their dreams. They are also known as HLPokies and for a good reason, since most of the games are slot machines. The attention paid to the Australian and Asian audience is self evident and many promos are aimed exclusively at these players. There are plenty of bonuses and campaigns to go around for international players and the casino has a fully-fledged loyalty scheme. The list of payment methods is relatively short, but the most effective and popular financial instruments are covered. Customer support isn’t available 24/7 but they still work 19 hours a day and can be reached via live chat and email. No compromises were made in regard to security and the games are monitored for fairness by independent auditors. COMODO provides encryption technology and so far there were no instances in which players were stripped of hard earned cash or had personal information jeopardized. - Happy Luke online casino has all the games available in instant play format. - You can choose between five distinct live dealer casinos. - Games are provided by seven leading developers and are proven fair. - Customer service isn’t available 24/7 and phone support is not offered. - Happy Luke Casino offers few payment methods. I grew up with healthy gambling in my house when my father would bring his buddies over for a game of cards. It was only natural when I grew up that I would continue the tradition, but doing it online is the best. Online gambling keeps me at home in my pajamas just the way I like it.